Is herbal medicine effective? Find out the reasons why it may not be working as well as you’d hoped. PASIG CITY, Philippines- With the resurgence of interest in natural ways of healing, a wide variety of herbal teas, capsules, and powders are being aggressively marketed to the public. Garden centers, for their part, are faced with an increasing demand for medicinal plants. Some health-conscious consumers are quick to jump in on the bandwagon, immediately buying this herbal supplement and growing that medicinal plant to use as tea. Others, meanwhile, dismiss all sorts of herbal medicine as quackery—even if they have never tried it themselves. Amid the ongoing debate over the effectiveness of herbal medicine, we turn to ATHAG President Dr. Bibiano “Boy” Fajardo, a longtime albularyo (traditional healer) who has almost five decades of experience in using herbs and other medicinal plants for healing. 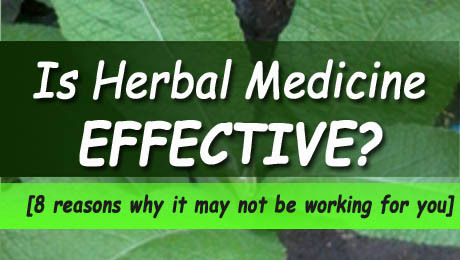 Why do some people say herbal medicine doesn’t work? From a layman’s perspective, herbal medicine seems to be quite simple—just take a few leaves or roots, boil, and drink. Or, in today’s herbal supplement saturated world, it can be as easy as popping a seaweed capsule or steeping an herbal tea bag in hot water. Your insides are full of “garbage.” You may be taking the correct herb for your ailment—but when it gets to your insides, it is not absorbed because your intestines are lined with junk matter. For herbal medicine to work, it needs to be absorbed by your body. You need a different variety of the same plant. Sometimes, a specific variety of one plant is more effective than its closely-related cousins. For example, there are native plant varieties that are more potent than their foreign counterparts. You may need to combine. There are herbs which work best when they are combined with particular medicinal plants. For maximum effectiveness, you should take these herbs in combination. However, a word of caution: there are also herbs which must NEVER be combined, because they can be toxic when taken together. You may have an underlying condition. Sometimes, one ailment is the result of another underlying condition. For healing to take place, the root condition must be addressed so it will stop causing the ailment you are trying to treat. Herbal medicine alone may not be enough for your illness. Medicinal plants are only one part of the healing equation. You may be religiously taking your herbs, but are not following the recommended diet. Or you may need Hilot to support your healing. In Philippine traditional medicine, herbs are most often taken in tandem with Hilot for maximum efficacy. What you know about herbal medicine is just “chismis” (gossip). Filipinos love sharing bits of information that they have overheard, seen on TV, or read somewhere. Sometimes, what is passed on to you is not anymore accurate information, but rather, plain chismis. What you know about a specific plant may not be what it was originally used for, or may not be true at all. You are self-medicating (and you are not an albularyo). If you think the words “self-medication” is only applicable to western drugs, think again. If you are not a healer yourself, it would be best for you to seek out the opinion of a respected traditional healer so he/she can properly determine what ails you, whether you will need any herbs, and what kind of herbs you would need. When you self-medicate, you run the risk of underassessing your condition, something which you may not realize until your condition has taken a turn for the worse. If you are considering taking a more natural route to healing through herbal medicine, take heart: traditional herbal treatment is backed by hundreds of years of wisdom and experience. You just have to make sure to do it the right way, so that it will work for you.